Behind the Bit: Riley meets saddle! On Friday we put a saddle on Riley. Bob was there to videotape, but he missed the first minute or so. As it happens, you didn't miss anything. Riley took it all in stride (so to speak), and we had to "make" him canter so that he could get used to the feeling of cantering under saddle. And here is the desensitization session. Well, that was my trainer's jumping saddle -- so light, so small! Sunday I put my 18" heavier dressage saddle on Riley. That got a bit more reaction, but it lasted only a few seconds. He kept turning and walking toward me, with a look that said "Can we be done with this?" If I was ever nervous about backing him (and riding him) I'm over it. My goal is to be on his back by July. Nice job! My Tucker was similarly unimpressed with the saddle. I think the bronco image so often expressed is not necessarily the norm. Riley is a nice mover and a pleasure to watch. 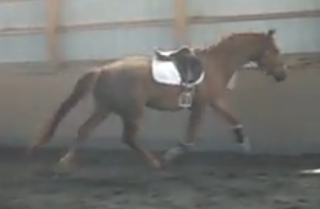 I especially like his canter. He looks really well balanced. He's going to be a wonderful ride. Love your annotations and choice of music! Also, just goes to show, that when you do all your ground work, saddling is no big deal. Ah, and you're on "Twitter" so will go find you there! D'aww... Riley is so cute. It looks like your progress is steady - that's how it's supposed to be - uneventful! Riley is beautiful. You and Riley are getting along famously. He looks like he will be an intelligent mount for you. Check the kidneys for the "flat back" you mentioned. You might even try acupuncture with him to relieve stress in the area. Riley looks unphased, which is great. He's very cute, hunter judges would love him!!! I have been working with my youngster who I think is about the same age as Riley. The first time I got on her she could have cared less. Aw very cute! Riley has very nice movement. nicely uphill in the first picture! Five O'Clock, he's pretty hunter-y, but he needs to do dressage too! Let's hope.